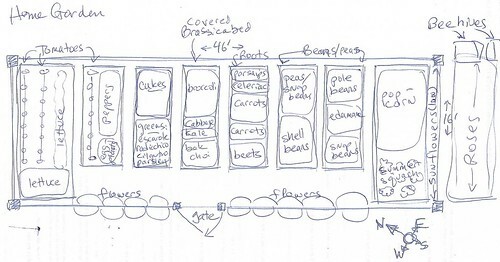 I drew up a couple diagrams for this year's gardens. 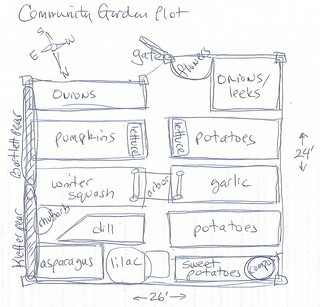 In planning for a new year, I always move everything so nothing grows in the same location as last last year (crop rotation). - I've moved the tomatoes to a bed that didn't have the store bought compost that made them sick last year. Last year, all my tomatoes had spindly growth, curled leaves, and very few tomatoes. I hope the move will help. - I'll add some flowers along the front fence. I thought I'd be adding a raised bed there eventually, but not enough room. I think flowers right in the soil will look nice. - This year, I'd like to have more broccoli, carrots, beets and shell beans. I don't think I had too much of anything last year. Maybe a few too many eggplants, snow peas and snap beans. I made more space for this year by removing the zinnias patch from the garden. - Growing flowers up the arbor rather than winter squash. Last year, I ended up with too much squash. - Moving the dill out of the onion beds and into its own bed. The dill self sows and its easy to leave it where it comes up. But I think my onions will do better with more sun. - I'm growing a lot less sweet potatoes this year. I didn't get a very good harvest last year. I had lots of very small tubers. I'll allocate a small space to the sweets for a while and see if I can get them to grow better. Maybe its just a matter of spacing the plants further apart, maybe I need new varieties. Too much N! Great, an easy fix. I won't amend the soil. I'll give it a try. Thanks! Happy New Year! Need to sort seed and do plan, although my sister and I have already decided to create a fruit tree orchard in one half of our second plot. We haven't much fruit at the Lottie, so decided this would be good and in the future be a lovely place to seek shade in the Summer.